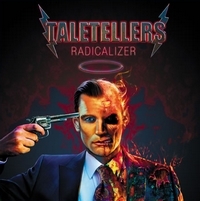 To be honest I haven't heard of Taletellers til I got this album. Well, I guess I read their name when they toured with Grave Digger and Alestorm in 2009, but as I haven't seen a show at European tour, it slipped my mind. Anyway, Taletellers was founded in 2005 and in 2006 they made their first step into the spotlight with the EP The Missiles Of Mercy. In 2008 their full-length debut Detonator was released. Now they are back with Radicalizer, they worked again with Phil Hillen at Su2-Studio and the artwork was done by Mark Wilkinson who did all cover artwork for them so far. The songs are fun, but after awhile they seem to repeat themselves and additionally the repetitive vocals makes it a bit boring... The songs can easily stand on their own, it's just that I miss variety. The repetitive vocals are my main critic point, coz without this repetitiveness the songs might show some new sound facets which so are drowning in the vocal performance.